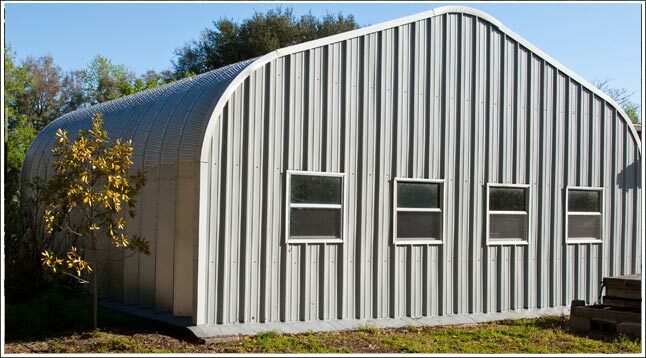 Metal garage kits and steel arch buildings for sale are custom designed and manufactured in our Florida home office facilities. Our main office is located in Tamarac, Florida where we custom design Metal Building Kings® arch metal garage kits for homeowners and businesses throughout the state from Dade County to Okaloosa. During Hurricane Andrew the only garage kits that suffered no damage where Metal Building Kings® steel arch structures. The arches, made of 80,000ksi tensile yield carbon steel with 7 and a half inch corrugation bolted down with base plates to a concrete foundation are virtually indestructible. In Florida the coral rock and sandy soil require only a monolithic floating concrete slab as a foundation as there is no frost line to worry about or seismic shifting. Steel panels tested in our 1,000 hour salt spray test, with aluminum-zinc alloy with the addition of silicon prevent aging and corrosion up to 700% more than other metal garages and last a guaranteed 40+ years even in the harshest conditions. Florida garage kits are the strongest prefab metal garage kits in the United States with 14 - 22 gauge steel and come in 4 models to choose from. Each building has different roof styles from the quonset style semi-circle to vertical, slanted or straight side walls with a pitched roof. Sizes are available from 13’ to 150 feet wide, 24’ tall and unlimited length. Customize your steel kit with fixed windows, 4 types of ventilation (Louver, Turbine, Gravity and Ridge), vents. Install overhead doors in your design that have 16 - 26 gauge steel roll up doors to 24 gauge ribbed setal sectional doors. Other accessories include roll insulation, installed panel insulation or spray foam insulation. Insulated panels are easiest to install because they come pre-insulated and are more effective in keeping the garage cool in the Florida humidity. Design your Florida garage kit with skylights for every 10 feet of roof space. The garage kit skylights have a curved shape that bends inward into the building vs. a flat window. In South Florida's subtropic climate the best metal building colors to choose from are our "cool paint" Lightstone, Galvalume Silver and Polar White with special pigments designed to reflect infrared energy while absorbing visible light. The paint has a 40 year limited warranty against peeling, flaking and adhesion loss. The special paint we used is baked into the steel is Energy Star and LEED compliant and reflects up to 70% of the Sunshine State's sun’s rays keeping the metal building interior cooler and more energy efficient. Our garage kits are manufactured to meet Miami-Dade hurricane wind code certification standards that apply to Florida and its wind velocity building codes especially in Miami, Dade County, Broward, Martin, St, Lucie, and Palm Beach County on the Atlantic Ocean's east coast and Gulf Coast beach counties of Collier, Lee, Sarasota and Pinellas county and the state's pan handle. At Metal Building Kings® we custom build your Florida metal garage kit steel arch building specifically according to all Florida county building codes and its practical use. Design, price and buy your building in Florida by using our price quote calculator or discount calculator or by calling our building support staff at 412-522-4797.